Welcome to my stop on the blog tour for this lovely book which I’m reviewing today. My thanks to Noelle Holten for the place on the tour and the review copy via Netgalley. A gripping book club novel about forbidden love, friendship and family secrets in a time of war. Perfect for fans of The Letterby Kathryn Hughes, The Notebook by Nicholas Sparks and The Guernsey Literary and Potato Peel Pie Society. 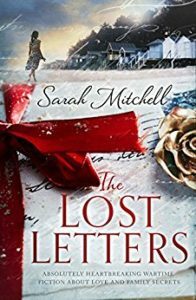 I do love a dual timeline story, especially when one of the stories is set during the Second World War, so The Lost Letters had immediate appeal for me. The two timelines are that of Martha in the present day and that of Sylvie in 1940s Norfolk. Martha’s father has just passed away before completing his memoirs and she finds that what he has left behind leaves her with more questions than answers. 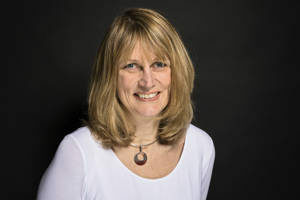 She leaves her home in Canada to spend the month of May in Norfolk to try and answer the questions she has: who is Catkins and why is a beach hut significant? Sylvie meets a woman and child by a beach hut in Norfolk just before war breaks out and they become friends. And this friendship leads to some far-reaching consequences over the years that follow. Normally with dual timeline stories, it’s the modern day story that really engages me, probably because there are usually a lot of discoveries to be made about the story in the past. But in the case of The Lost Letters I think I much preferred Sylvie’s story. It’s a perfect snapshot of wartime and how much it changed people and families. It’s so engaging, so interesting. I found it similar in a way to Kate Atkinson’s wartime writing – very intuitive and evocative. But that’s not to say that Martha’s story is not engaging because it is. She’s a bit adrift after losing her father. Her daughter is away from home at Cambridge University and is drifting away from Martha. She’s wondering which way to turn in her life. I really enjoyed her journey of discovery about herself, her daughter, her family and her life. I thought The Lost Letters was a beautifully written story. It’s not overly sentimental but it did move me and I think that was because of the quality of the writing and the way that I started to care about the characters and what happened to them. After a slightly slow start I found myself completely embroiled in a story that is quite melancholy at times, full of emotion and depth. 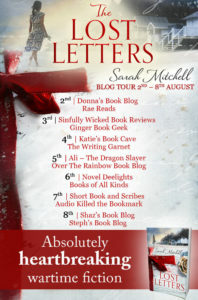 After a debut of this quality I shall very much look forward to Sarah Mitchell’s next book.